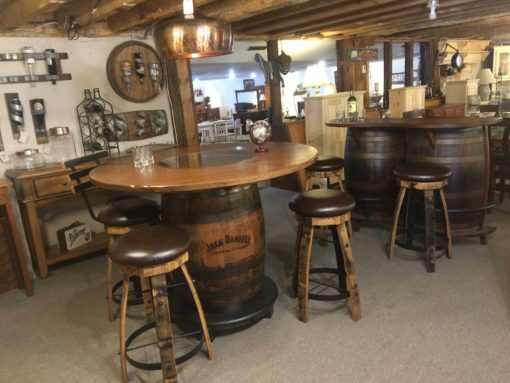 Genuine Jack Daniels barrel that has been fashioned into a bar table. The top is made of Quarter Sawn White Oak, and there is a metal base that also acts as a foot rest. Stools available both with and without backs. ©2019 Marty's Barn Cellar. All Rights Reserved. Marty's Barn Cellar offers real wood home furniture to customers in the Central New York area including, Syracuse, East Syracuse, Manlius, Fayetteville, Cazenovia, Auburn, Skaneateles, Ithaca, and more.